Ideally situated on a popular residential street, this fantastic one bedroom first floor flat boasts stylish interiors, wooden flooring and high ceilings throughout. Chichele Road is well served for local amenities along Cricklewood Broadway and in nearby Willesden. 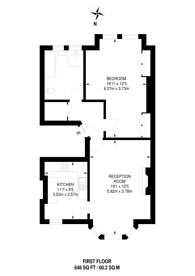 Willesden Green is the nearest Underground station offering excellent links towards London.